Description Canertinib is an irreversible quinazoline-based inhibitor of HER family tyrosine kinases with IC50 values of 0.8, 19 and 7 nM for EGFR, HER2 and HER4, respectively. 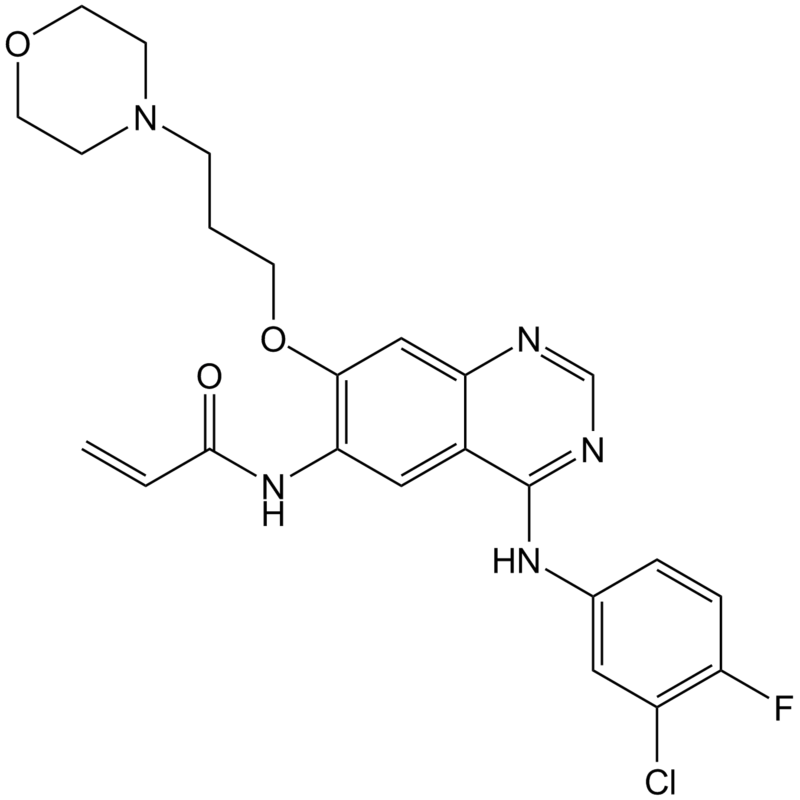 Canertinib (also known as CI-1033), a 3-chloro, 4-fluoro, 4-anilinoquinazoline, is an orally available, potent and irreversible Pan-erbB tyrosine kinase inhibitor that inhibits EGFR, HER2 and HER4 in vitro with the half maximal inhibition concentration IC50 of 0.8 nM, 19 nM and 7 nM respectively . Canertinib irreversibly binds into the ATP pocket within the TK domain of all erbB family members, where the acrylamide side-chain at position C6 of canertinib is brought into close proximity with cysteines of erbB members, followed by the rapid formation of a covalent bond, which permanently inactivates the catalytically active erB1, erB2 and erB4 family members and effectively inhibits erbB3-dependent signaling . Michelle Arkin, Mark M. Moasser. HER2 directed small molecule antagonists. Curr Opin Investig Drugs. Author manuscript; available in PMC 2011 February 1. Published in final edited form as: Curr Opin Investig Drugs. 2008 December; 9(12): 1264–1276. Calvo E, Tolcher AW, Hammond LA, Patnaik A, de Bono JS, Eiseman IA, Olson SC, Lenehan PF, McCreery H, Lorusso P, Rowinsky EK. Administration of CI-1033, an irreversible pan-erbB tyrosine kinase inhibitor, is feasible on a 7-day on, 7-day off schedule: a phase I pharmacokinetic and food effect study. Clin Cancer Res. 2004 Nov 1;10(21):7112-20.